THE musician in the painting ''The Bass Player'' has long, languid arms wrapped around his instrument, his eyes half-closed. He seems lost in his own world. So at times does the portrait's artist, Justin Bua, whose characters are from a world far away in place and time: the pregentrified streets of the Upper West Side of Manhattan in the 1970s and '80s. This is where he grew up, a latchkey child hanging out on the street, sneaking into pool halls and Ping-Pong parlors, mingling with gamblers and hustlers, watching drug pushers and gun-toting passers-by. “They were completely survival-oriented or they were crazy,” Mr. Bua said of the street denizens who have informed his art. 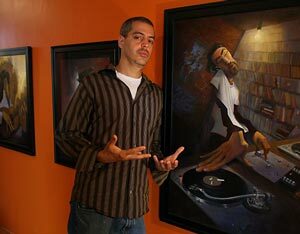 The book is also an ode to the birth of hip-hop — to the D.J.’s, the M.C.’s, the B-boys of a cultural movement whose energy and lawlessness, Mr. Bua said, spawned his own “distorted urban realism” style of painting. For the last 14 years Mr. Bua has recreated the New York street characters of his childhood and adolescence while working in a downtown Los Angeles studio not far from skid row. Mr. Bua says “work, weather and women” have kept him on the West Coast, where he received a bachelor of fine arts in illustration in 1993 from the Art Center College of Design in Pasadena. Divorced, he now lives with his 2 1/2-year-old daughter, Akira, in Echo Park. He first found jobs doing storyboards for movies and commercials, he said, and then illustrated the undersides of slick skateboards and covers for CDs and magazines. In the early 1990s he began creating paintings, and made posters of them. Some of the posters — like “The DJ,” which depicts a turntablist in full hip-hop attitude and regalia — have made him well known among college students and young music and graffiti-art fans. At galleries like Off the Wall on Haight Street in San Francisco, Mr. Bua’s posters are consistent best sellers along with those by poster artists like Emek. Mr. Bua says the posters have led people to his paintings, which now sell for $5,000 to $150,000 and have attracted a Hollywood following since the actress Christina Ricci bought two in 1997. His collectors include Eva Longoria of “Desperate Housewives” and her fiancé, the pro basketball player Tony Parker. Thirty of Mr. Bua’s paintings and drawings and 12 limited-edition prints were exhibited recently at the Limited Addiction Gallery in Denver. The gallery’s owner, Dave Smith, described Mr. Bua as a leader in the growing urban contemporary-art movement. Growing up on the Upper West Side until he was 16 and then in East Flatbush in Brooklyn, Mr. Bua was swept up in the hip-hop scene. “It wasn’t about what race you’re from, which is what New York City was about at the time, but about a culture bonded together creatively,” said Mr. Bua, whose background includes Jewish, Puerto Rican and Irish strands. Mr. Bua was barely 11 when he first saw break dancing on a corner of 99th Street and Amsterdam Avenue. He was smitten and later toured with break-dancing crews in the United States and Europe. But Mr. Bua also drew and painted, and his talent got him into the Fiorello H. LaGuardia High School of Music and Art and Performing Arts. By the mid-1980s, he said, he was spending most of his time transferring the rhythm of dancing to the canvas. 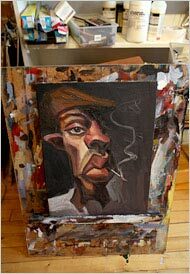 “The Bass Player,” a work in progress that he nevertheless recently sold for $60,000, is part of a prolific output of jazz-inspired paintings and posters. They sell more than any other theme, Mr. Bua said, but more important, he considers them “cool” to paint. Mr. Bua, who teaches figure drawing at the University of Southern California and lectures in colleges and schools, is now branching out into television and film. He’s developing an animated series for Comedy Central and is working on a reality show — a “Project Runway”-type show for both street artists and the classically trained — that he hopes to sell to a cable network. In Los Angeles he has found an urban landscape whose population, if not the same mix as in New York, also fascinates him.